A MAN has told a court how a murder accused threatened to climb through a window at his home and shoot him. Craig Goodfellow, 30, told a jury on Thursday that James Caven, 39, abused him after coming to his home in Macmerry, East Lothian. The High Court in Edinburgh heard that Mr Caven allegedly told Mr Goodfellow that he should do his “background” on him . Telling prosecution lawyer Ian Wallace about the alleged incident Mr Goodfellow said: “He told me that he knew my living room window was open at night time. Mr Goodfellow was giving evidence on the second day of proceedings against Mr Caven, who denies murdering Colin Armstrong in Macmerry in October 2014. Prosecutors allege that the incident between Mr Goodfellow and Mr Caven took place on September 7 2014. On Thursday, Mr Goodfellow told the court that he had been watching a Grand Prix on TV when Mr Caven came to his home in Greenmill Brae looking for painkillers. Mr Goodfellow told the court that Caven lived nearby and was occasionally using a wheelchair at the time of the alleged incident. Mr Goodfellow also said that when he told Caven that there wasn’t any painkillers in his home, the wheelchair user became aggressive and abused him. Mr Goodfellow said that Caven threatened to come into his house and shoot him. Mr Caven, a prisoner of HMP Edinburgh, has pleaded not guilty to a total of nine charges. Prosecutors allege that on September 6 2014, at Greenmill Brae, Macmerry, Caven uttered threats to William Maryniuk, 31, and threatened to stab Colin Armstrong. The Crown also claim that on September 7 2014 at 21 Greenmill Brae, Caven breached the Criminal Justice and Licensing Act by behaving in a threatening manner towards Craig Goodfellow. 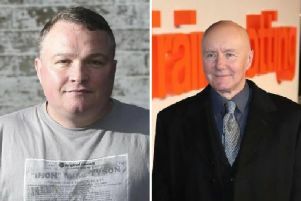 On the same date, at 5 Greenmill Brae, Caven is also alleged to have acted in a threatening or abusive manner by shouting, swearing and threatening Police Constables Robert Wallace and Robert Finlay. Prosecutors also allege that on September 27 2014, at the Brigg Inn in Bridge Street, Tranent, East Lothian, Caven behaved in a disorderly manner by refusing to leave the premises when required to do so by PC Keith Douglas. On September 28 or 29 2014, at 5 Greenmill Brae,Macmerry, Caven allegedly assaulted Colin Armstrong by punching him on the head. Prosecutors also claim that on October 2 2014 at Civic Square, Tranent, East Lothian, Caven assaulted Mr Armstrong by pushing him on the body, punching him on the head. His actions allegedly caused Mr Armstrong to fall to the ground - Mr Caven then allegedly repeatedly kicked him on the body. On the same date,at East Coast Cars in Prestonpans, East Lothian, Caven allegedly assaulted Iain Quin (CORR) by punching him on the head. Prosecutors also claim that on October 6 and 7, at 5 Greenmill Brae, Caven breached an undertaking given at Haddington Sheriff Court in October 2014, not to be in the company of Colin Armstrong. On October 6 or October 7 2014 at 5 Greenmill Brae, East Lothian, Mr Caven is said to have murdered Mr Armstrong by repeatedly striking him on the neck and body with a knife or similar instrument. Mr Caven is represented by solicitor advocate John Scott QC.